Discussion in 'Inactive/Unsupported Plugins' started by zhuowei, Aug 12, 2011. This is a clone of iChun's single player Pig Grinder mod, and was requested on this thread. The grinder texture is by iChun. This plugin's project page on BukkitDev is here. Right-click a pig with it, and the grinder will cut the pig into slices of delicious bacon from the inside out. When there is no more bacon left in the pig's empty shell, the pig explodes. The grinder will also work on sheep and cows, spitting out wool and steak, respectively. Get pork/steak/wool. Lots of it. Configurable amount of pork spawned per pig, rate of spawn, and whether pigs explode when they are exhausted of pork. Optional Spout support. If Spout is detected, players with the Spoutcraft client will see the grinder on the animal when it is attached. Optionally, the grinder can have a custom name and texture for the users with Spoutcraft, enabled in the configuration file. use-spout-item: Whether to use a SpoutPlugin custom item for the grinder. Added ability to grind sheep and cows. Switched to iChun's grinder icon. Spout's api changed for 1.0.5, and the plugin had to be fixed. strongy7, JustDoAsIDo, kahlilnc and 1 other person like this. all the pigs die tonight! nice! u made my plugin and a page for it!!! Gross, but useful. I'd like the option for it NOT to explode. yeah... that would be a great thing! Done. In the configuration, change explode to false. 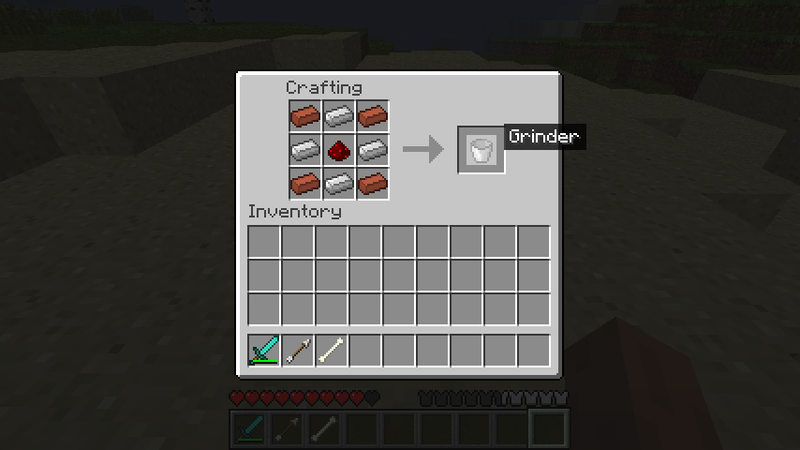 Currently, like the original mod, grinders can only be used once. The pork you get is worth the original materials, though. Now I would just like a Permission node for creating the Grinder and one for using it. I'm probably not going to add this feature. If you want to add it, feel free to fork the project and, if it works, send me a pull request on GitHub. This isn't implemented in this plugin yet. Hello sir, I thoroughly enjoyed your plugin. I decided to do a plugin spotlight on it to show how much i enjoyed it. I hope you get around to watching it. i know you added spout to make a texture for the grinder on the pig... can you try to make the bucket say "pig grinder" when you mouse over it in your inventory? hey if you can change the skin of the pig when it has the grinder on it can you make so that the bucket is a grinder instead? In the next version. I think the dev version of Spout now has support for this. It already says "Grinder" if you have Spout. Not quite what you're looking for, but I added the ability to grind cows and sheep. This has potential for greifer control, an admin sticks a grinder on a griefer and changes that persons perms so they cannot build or interact with the world, Whilst the griefer is running around quite annoyed the grinder chops them up and spews rotten flesh (well greifers are rotten !) and the contence of their inventory. after about 5 mins the griefer explodes (non damages environment) and then is banned and broadcast to the server.